Greetings, Space Fans, or Space Fan, whomever you are! Recently I read an extraordinary book by a marketing expert by the name of Seth Godin, Purple Cow. The premise of the book is this: If you’re driving through the countryside, and come across fields full of various cows, you know, brown cows, black and white cows, etc., at first you might think, ‘Cool, cows!”…this would last about, let’s say, 5 minutes. Then the invasion of cows would quickly lose your interest. Undoubtedly, you would have to make a remark. Someone might take out their cell phone and take a picture, and send it to a friend. Someone else might call a friend and say, “You won’t believe what I am looking at while we speak…” Your kids might jump out of the car, jump the fence, and touch the cow. You would then have them pose for a family picture with this celebrity cow. This cow would truly be REMARKable. 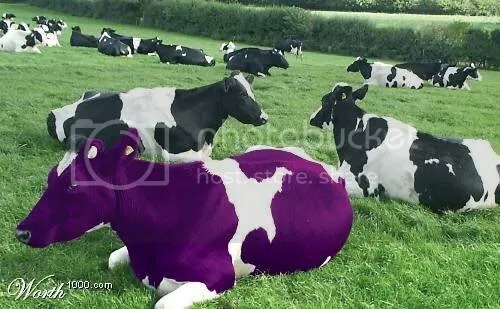 Seth says that to compete in today’s market of mass produced products sold to the masses, it is a must that you design your product as a Purple Cow from the get go. Beginning in the design phase, not as an afterthought. I could elaborate on this for hours, but here’s my take away, and my send away…How can you make your life a purple cow? What can you do in your life that would make you REMARKable? How could you stand out, be enchanting to others that you meet, in such a way that you are genuine and authentic, yet dynamic at the same time? I think this idea is especially helpful for those who are job hunting, or considering a career change. As well as those designing their personal brand.